Decades of US Israel nuclear entanglements and occupation of Palestine have reaped a tangled mass impeding movement. Once anyone or thing is entangled; extrication does not come easily but is possible. 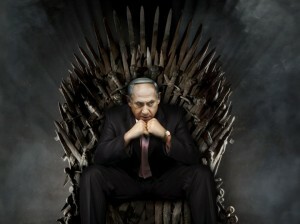 From Jerusalem on Monday, The New York Times reported, Netanyahu Says No to Statehood for Palestinians…Mr. Netanyahu’s chief challenger, Isaac Herzog of the center-left Zionist Union, backs the two-state solution and has promised to try to restart talks with the Palestinians. Netanyahu called for early elections three months ago aiming to replace a governing coalition fractured over Palestinian rights and religion. The results of the Israeli elections show the success of a campaign platform based on settlements, racism, apartheid and the denial of the fundamental human rights of the Palestinian people. Such a result would not have been possible had the international community held Israel to account for its systematic violations of international law. Now, more than ever, the international community must act. It must rally behind Palestinian efforts to internationalize our struggle for dignity and freedom through the International Criminal Court and through all other peaceful means. 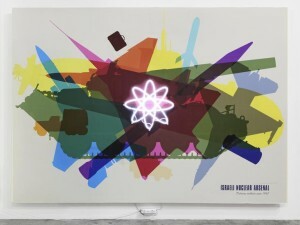 A peaceful means was created by Berlin-based Venezuelan artist Alessandro Balteo Yazbeck who has been producing his “modern entanglements” motivated by socio-political questions involving gaps in collective knowledge or misrepresentations in the public record often focusing on the importance of propaganda as a political strategy. Authority is a recurring theme and his research often “entangles” disparate disciplines and geographies, resulting in multi-layered installations that bring together what appear to be disconnected subjects. 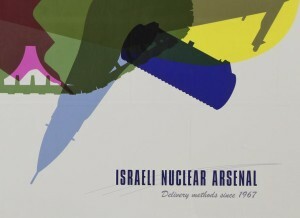 “The Israeli Nuclear Arsenal series speaks to one such case, uncovering a suppressed history of US-Israeli relations. “Here, the artist refers to the tradition of whistleblowers and specifically Mordecai Vanunu, who spent more than 18 years in Israeli prisons for his 1986 leaked images that blew open Israel’s long-covert nuclear armament program. Conversational fragments excerpted from a secret 1961 meeting between John F. Kennedy and David Ben-Gurion are printed on an abstract painting, the kind that the CIA infamously instrumentalised during the Cold War. The series of billboards in turn draws attention to the parallels between state propaganda and advertising. On May 18, 1961 this telegram was sent from USA Department of State to the Embassy in Israel transmitting the text of a letter from President Kennedy to Israeli Prime Minister Ben Gurion on arrangements to visit Dimona. I welcome your letter of May 12 and am giving it careful study. Meanwhile, I have received from Ambassador Barbour a report of his conversation with you on May 14 regarding the arrangements for visiting the Dimona reactor. I should like to add some personal comments on that subject. I am sure you will agree that there is no more urgent business for the whole world than the control of nuclear weapons. We both recognized this when we talked together two years ago, and I emphasized it again when I met with Mrs. Meir just after Christmas. The dangers in the proliferation of national nuclear weapons systems are so obvious that I am sure I need not repeat them here. It is because of our preoccupation with this problem that my Government has sought to arrange with you for periodic visits to Dimona. When we spoke together in May 1961 you said that we might make whatever use we wished of the information resulting from the first visit of American scientists to Dimona and that you would agree to further visits by neutrals as well. I had assumed from Mrs. Meir’s comment that there would be no problem between us on this. We are concerned with the disturbing effects on world stability, which would accompany the development of a nuclear weapons capability by Israel. I cannot imagine that the Arabs would refrain from turning to the Soviet Union for assistance if Israel were to develop a nuclear weapons capability–with all the consequences this would hold. But the problem is much larger than its impact on the Middle East. Development of a nuclear weapons capability by Israel would almost certainly lead other larger countries that have so far refrained from such development, to feel that they must follow suit. I can well appreciate your concern for developments in the UAR. 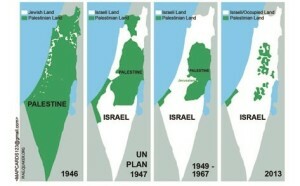 But I see no present or imminent nuclear threat to Israel from there. I am assured that our intelligence on this question is good and that the Egyptians do not presently have any installation comparable to Dimona, nor any facilities potentially capable of nuclear weapons production. But, of course, if you have information that would support a contrary conclusion, I should like to receive it from you through Ambassador Barbour. We have the capacity to check it. I trust this message will convey the sense of urgency and the perspective in which I view your Government’s early assent to the proposal first put to you by Ambassador Barbour on April 2. When Johnson became president, he made an agreement with Israel that two senators would come every year to inspect. Before the senators would visit, the Israelis would build a wall to block the underground elevators and stairways. From 1963 to ’69, the senators came, but they never knew about the wall that hid the rest of the Dimona from them. King Bibi’s hard-line stance against Iran’s nuclear program and continued construction of illegal settlements in the West Bank could be the fuel for President Obama to earn his Nobel Peace Prize by ENDING US Israel Nuclear Entanglements and Occupation of Palestine. 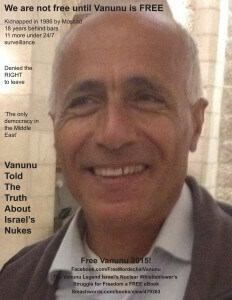 Sign the Petition to World Media and Israel: We are not free, until Vanunu is free! THIS POST HAS BEEN READ 12212 TIMES SO FAR. THANK YOU!